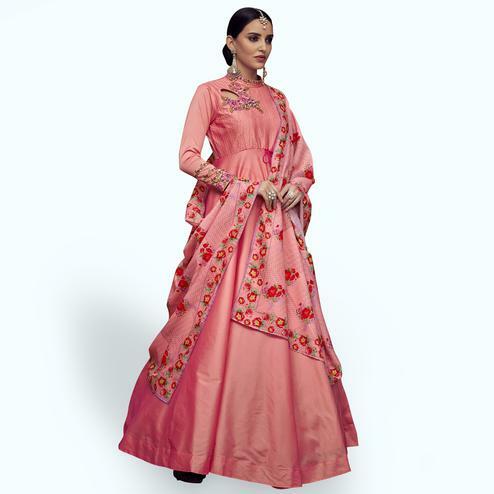 This latest party wear designer eye-catching peach colored anarkali suit has an attractive embroidery designs and sleeves embellished with thread work embroidery work gives an elegant look. This dress is a hit any evening party be it a bridal event like sangeet shaadi or a festive occasion like Dussehra Diwali Eid or Janmashtami celebration . The anarkali is of georgette, the bottom is of santoon fabric and the dupatta is of chiffon. Length chest upto 34 - 42 inches and length upto 54 - 56 inches.